Give your team a tool they love. Flywheel Mobile ends data entry drudgery, gives your team helpful actions. Flywheel pushes notifications to your team’s phone: Follow up reminders, customer health information, dashboards. Flywheel acts as your helpful sales assistant. 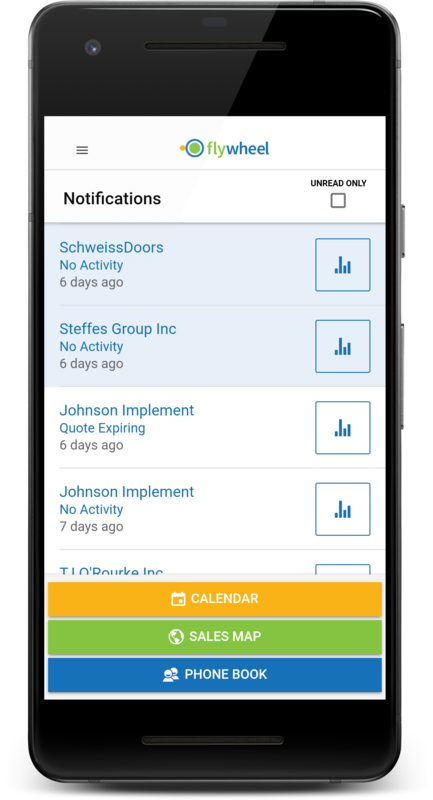 It automatically tracks activities and reminds you to follow up so you can focus on building key relationships. 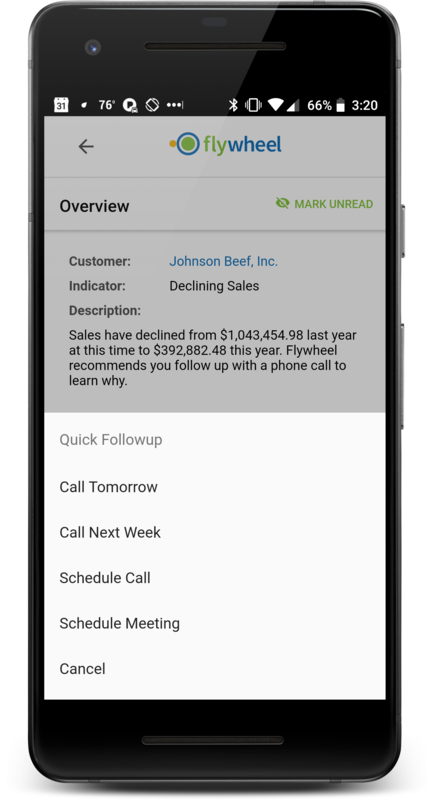 No more CRM adoption worries. Reps learn Flywheel Mobile in 15 minutes or less. Optionally reps can add call notes by voice. Automated logging of Exchange-based incoming & outgoing email – Outlook not required. Ends “I forgot to log that in CRM” issues. 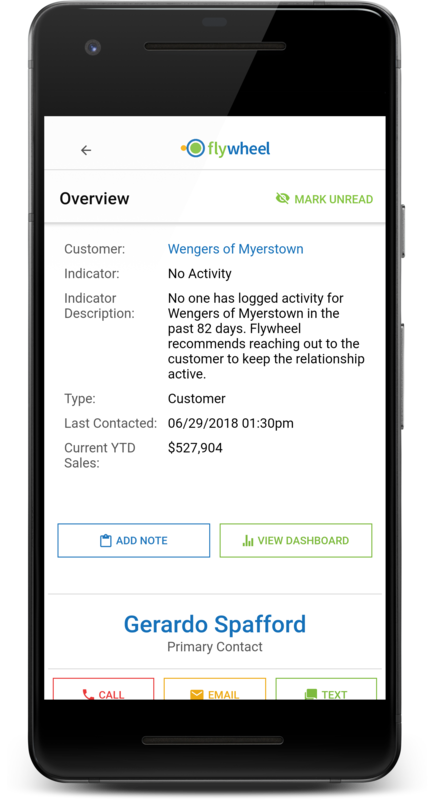 Flywheel Mobile tracks incoming & outgoing text messages from customers only (does not log texts from phone numbers not in CRM) for simple/easy access. Also allows for text approvals of orders/quotes. Receive push notifications when you haven’t followed up with a lead or account recently. Follow up with a Call, Email or Meeting with one tap. No more typing out call notes. With the tap of a button, Flywheel transcribes your voice into call or meeting notes. 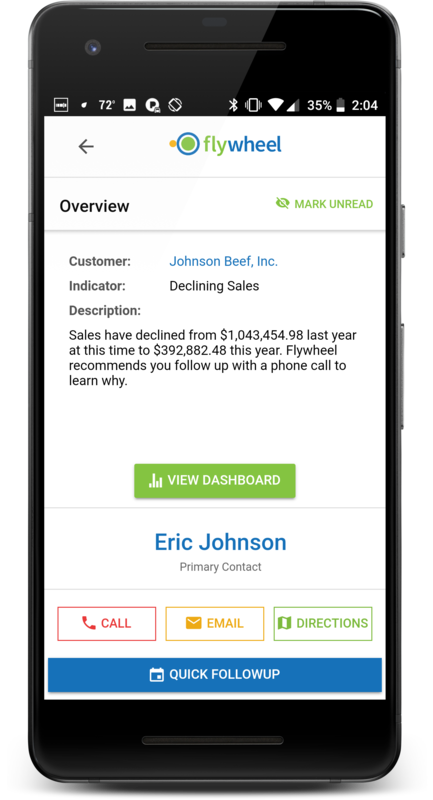 Find accounts & leads by speaking into your phone! One-touch closed win/loss capture on leads you assign to dealers. Don’t ask salespeople to dig through charts or lists. Push notifications with read/unread information drive activities in Flywheel Mobile. Never again forget to contact a customer or prospect before a quote expires. Visual product purchasing dashboard information & product category info at a glance. Our rules-based engine can distribute leads automatically to reps or dealers based on geo, product line, or other logic. Schedule a 1:1 demo with one of our experts to see the product and discuss how it could help your team.